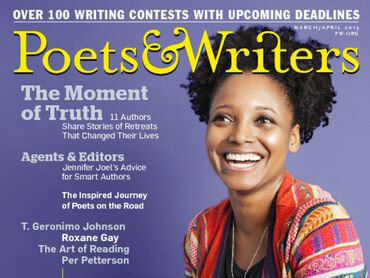 Before there was Poets & Writers, there was Poets and Writers Inc., what is now the “largest nonprofit organization in the United States for writers of poetry, fiction and creative nonfiction.” The magazine created by the organization 45 years ago caters to the same population, and knows this refers to both its audience and its freelancers. Found in the front-of-book, this section consists of 500- to 1,200-word pieces that focus on timely happenings in the publishing industry and literary community news. Examples include the growth of The Telling Room, a nonprofit that empowers young writers through storytelling, and Fig Tree Books venturing into the literary scene.